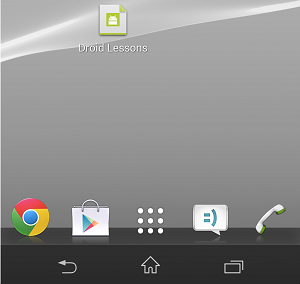 Wouldn’t it be nice to be able to create a shortcut to your favorite website on your Android Homescreen? How many times have you found yourself trudging through countless menus to get to the web page you really need? It would perhaps not be a problem if your internet was so fast that waiting times were a thing of the past, but let’s face it, we still get fed up with waiting. So, “what’s the solution”, I hear you asking. Well how about once we have reached our final destination (the web page we have been searching for) we could turn it into a home screen icon. 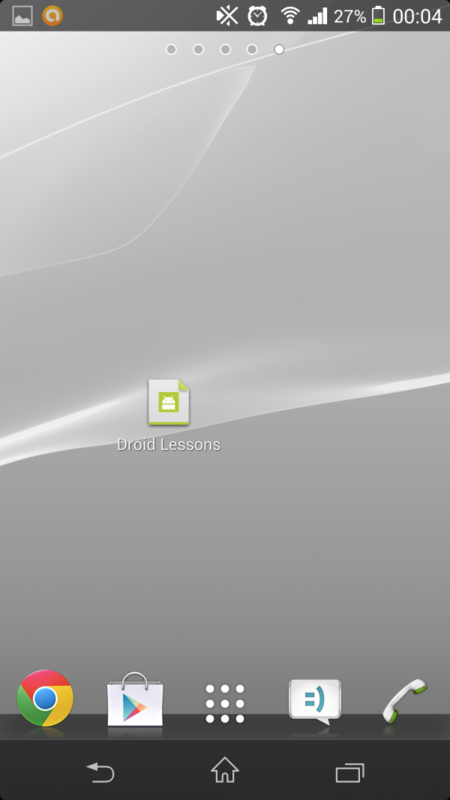 Simply put, on your home screen, all you need to do is press on the icon like accessing an application, and it takes you straight through to the page. Check out our easy to follow step-by-step guide below to learn how! 1. 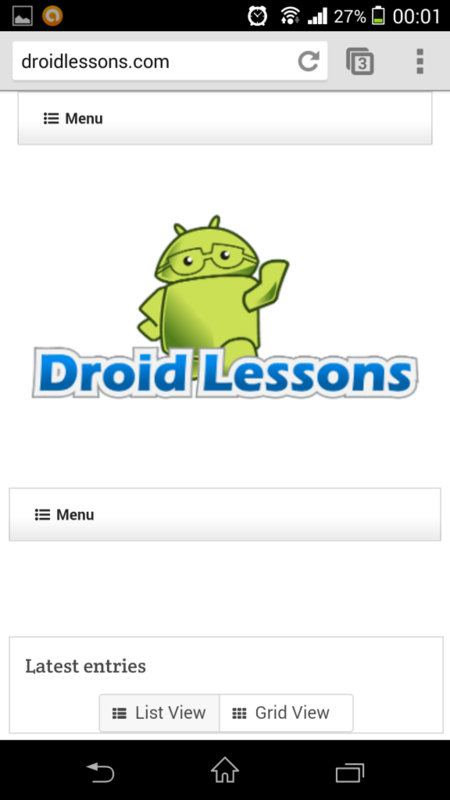 I will be showing you how its done on Google Chrome, it’s my internet browser of choice for Android. 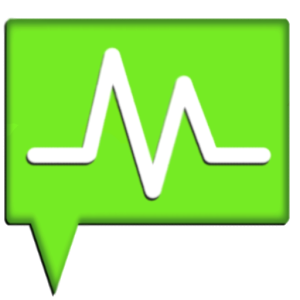 It comes standard on most devices, but it is quick, easy to use and works really well on Android (obviously because its made by Google). 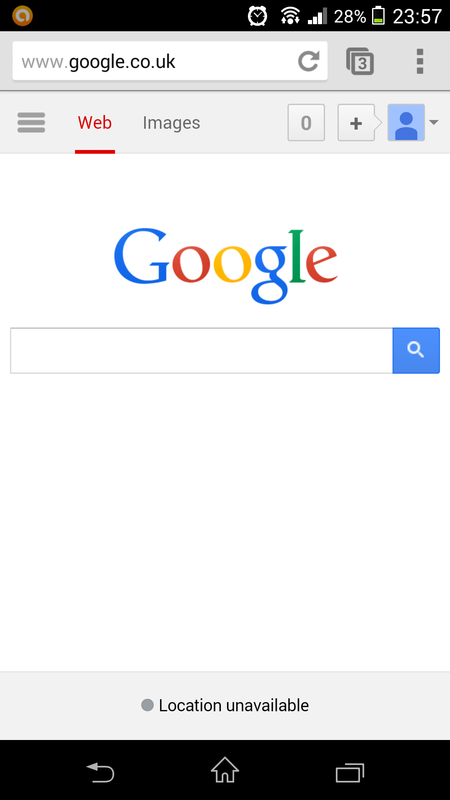 This is what you will see when opening the browser. 2. Next simply start the normal process of getting to your final destination, whether it be a certain page on a news website or results page for a searching site. 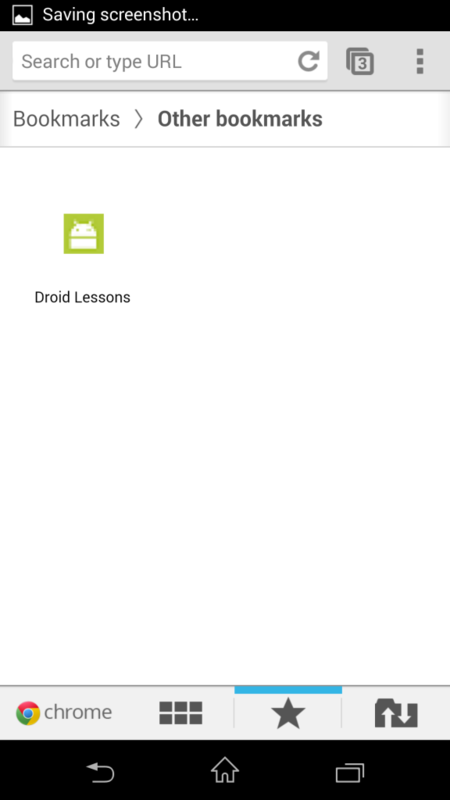 I will be keeping it simple with just the Droid Lessons home screen. 3. 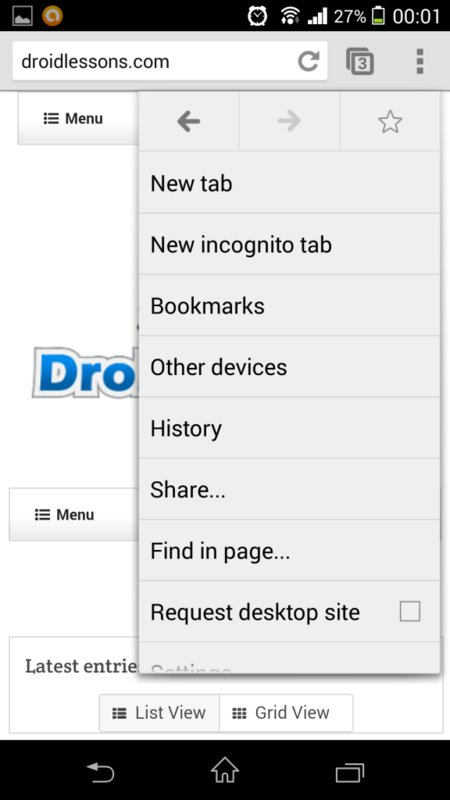 Once you have your chosen page up on the browser, the next step is to bookmark the webpage, you do this by clicking on Settings, this is the 3 little dots stacked on top of each other and once pressed you should see something similar to this. 4. Now, in the top right hand corner of that menu, there is a star symbol, sometimes on tablets this can be found on the far right hand side of the web address bar and not on the drop down menu. You need to press this star and it will change color, but also take you to a page which will look like this. 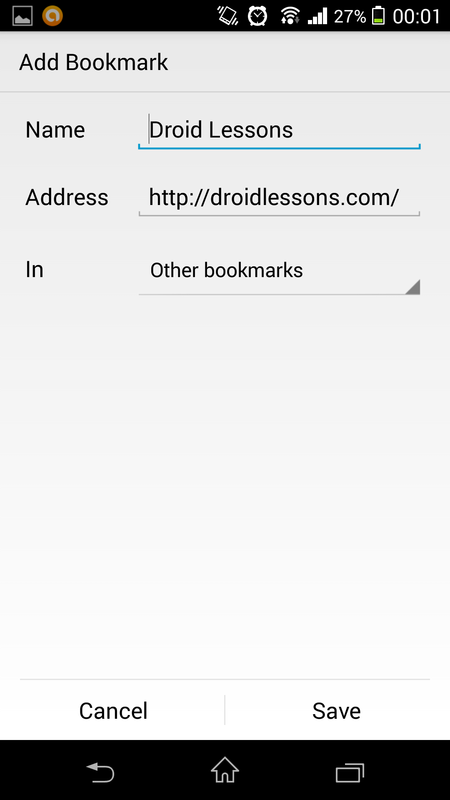 Here you can change the name of the bookmark for easier referencing, it shows you what the web address is and also gives you the option to store your bookmark in different folders. I will be saving mine simply in “Other bookmark”. 5. Once you click save, you need to follow the same process of opening up the settings menu again by clicking on those 3 dots. 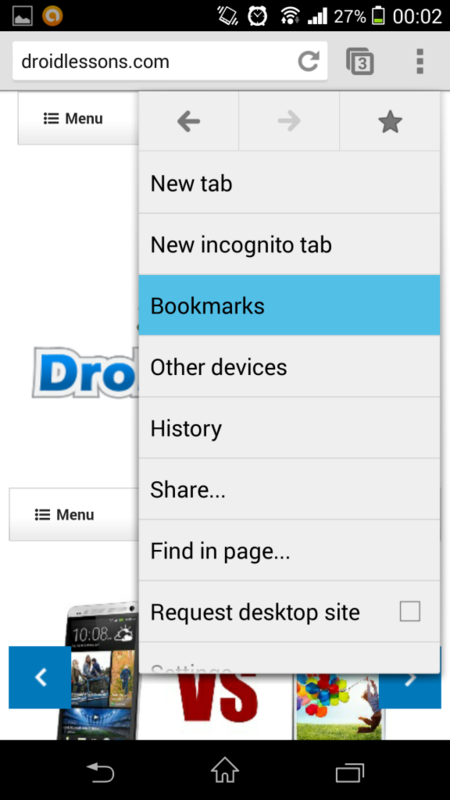 This time though you will be choosing the option “Bookmarks”. bookmarks” and you should see the bookmark with the name you gave it. 7. Now press and hold your finger on the icon (your bookmark) and an option menu will appear. 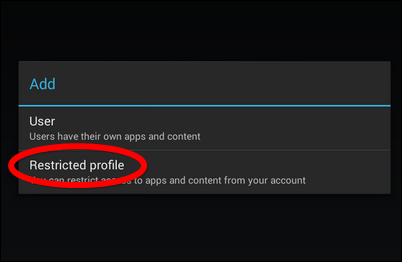 Select the “Add to home screen” option, it should all look like this. 8. 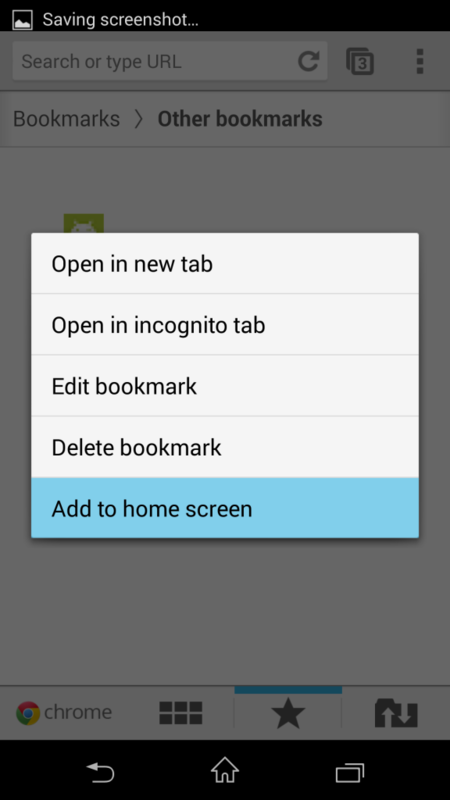 Once selected your home screen should now contain your bookmark shortcut to your favorite website. Nice and easy! That’s basically it! Now when you press this icon it will take you straight through to the webpage that you saved as a bookmark. No more searching through various web pages… simply one press of a button and you will be taken right to your favorite website of choice. If you are having any problems, you have questions on how to operate on a different browser, or it doesn’t seem to be working for you then please leave a comment below and we will get back to you.